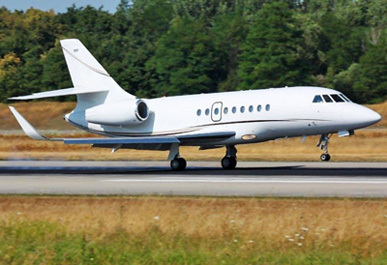 Dassault Falcon 2000LX Easy – это французский бизнес джет от компании Dassault Aviation. Самолет Falcon 2000LX Easy представляет собой двухмоторный бизнес джет на основе Dassault Falcon 2000EX. Бизнес джет Falcon 2000LX – это лучшие традиции Dassault Aviation, обеспечивающие непревзойденное сочетание скорости, LUX комфорта, высокой маневренности, дальности полета и привлекательной экономики эксплуатации. 365 дней в году Falcon 2000LX упорно трудится, чтобы предоставить высокий уровень производительности и надежности для Вас и Вашего бизнеса. Самолет Falcon 2000LX обеспечивает лучшую в своем классе скорость подъема - достигает 41000 футов за 19 минут. Крейсерская скорость бизнес джета Falcon 2000LX - 850 км/ч. Eqipment details: Aviation Partners Blended winglets, Securaplane XL-245 lead acid batteries, GPU main battery charging, KGS Electronics 115-volt/60Hz AC power, cabin & galley master electrical systems, electric AirStair door, therapeutic oxygen system w/one mask & outlet, telescopic tow bar, Cargo tie downs, hydraulic system servicing storage, 115-cubic foot enlarged oxygen bottle, 10-gallon potable water system, crash axe w/storage, dual Winslow 9-person life rafts w/406 ELT, emergency transceiver & storage provisions, Dual Teleflex tail recognition, service. 9 passenger executive seating, rounded-look floor plan. Townsend leather, embossed nubuck cowhide color Spice. 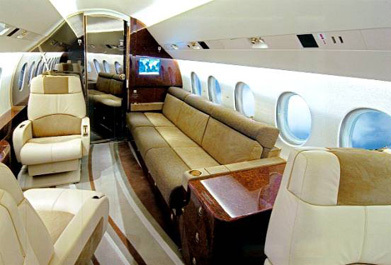 Option 1 floor plan, forward 4-place club, aft 3-place divan, 2 additional aft club seats, 16G seating, third ERDA flight deck seat w/storage drawer and hanger bar. 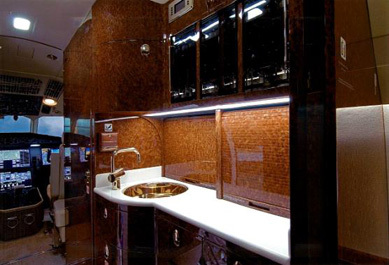 36” Galley/Bar upper section w/ “rounded look”, w/extra-wide high-temperature oven w/digital controller, microwave, automatic coffeemaker, Vola faucet assembly w/hot/cold water spigot, hot cup, standard glassware storage. Two Atlas tray carriers, three pull-out storage drawers, dry-ice trays, ice chest w/integral cover and removable divider, trash drawer, cold storage drawer. Forward executive tables, three rounded-look console tables, custom wood veneer side ledge. Rosen plug-in LCD monitor receptacle & dual 8.4-inch plug-in LCD monitors w/ 9G locking arm. Airshow 410 cabin display w/world-wide maps, English & metric flight information, RLI, five audio/static video briefings & flightdeck controller, 8 Sony MDR-V500DJ lightweight stereo headsets. LS rounded-look 30-inch closet/entertainment cabinet. DVD player & IR remote controls, auxiliary cabin audio/NTSC video interface for portable devices. Honeywell 20-inch LCD monitor. MED auxiliary work surfaces w/storage, galley pocket/sliding door, forward seats w/electric lumbar support & adjustable articulating “bread board” 9.5-inch wide headrests, dual aft individual seats w/electric lumbar support & recliner leg rests. Aft lav w/liquid soap dispenser, trash container & Vola faucet assembly, cold air outlets installed for each passenger seat and lavatories. LS crew closet w/horizontal aircraft manual storage, aft lav w/three pull-out storage drawers w/multi-position rib-foil dividers. aft baggage w/fold down hanger bar. Dual fwd & aft lavatory. 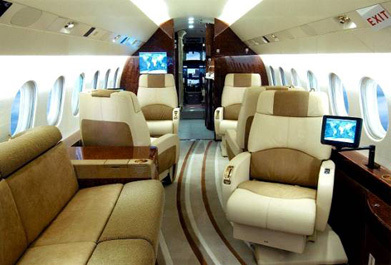 Cocpit details: Honeywell EASy EGPWS, AirCell ST-3100 Iridium SATCOM, triple Honeywell AV-900 audio panels, Honeywell EASy comm management function. Honeywell EASy modular avionics unit, Honeywell EASy electronic display & management, dual Honeywell marker beacons, dual Honeywell AZ-200 air data, Meggitt Mark II secondary flight display. Hooneywell CMC-901, BFGoodrich ice detector (advisory only), Honeywell EASy autothrottle, avionics master system, mini-load master system, Honeywell EASy data acquisition & central maintenance. 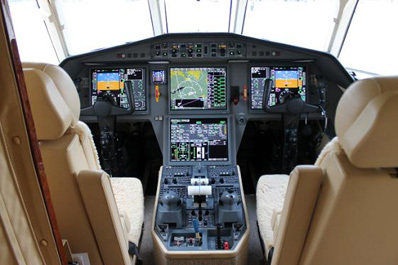 ELTA ADT-406 ELT, cabin temperature indicating system, Honeywell EASy cockpit, Honeywell EASy electronic Jeppesen charts, overhead assist handle, Miltope flightdeck printer.